To me, there is nothing like letting a brilliant sunset warm the senses as it bursts with its gorgeous colors only nature can create. 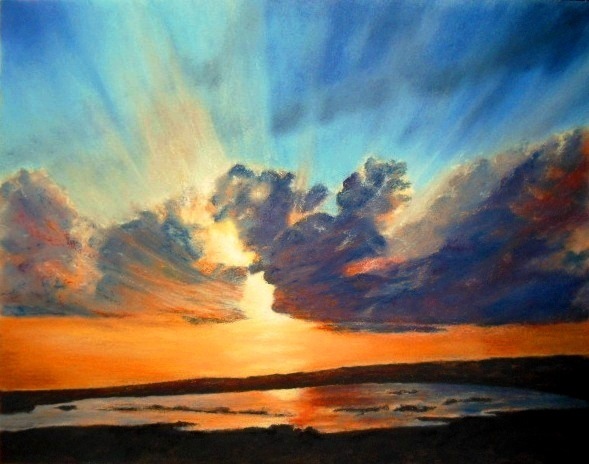 I love the explosion of colors that the sun illuminates the sky with as it sets – for an artist its excitement on steroids. I love them and decided a couple of months ago to do a series of sunsets. The four underpaintings are done let me introduce you to the first completed painting, Sunset Bursting Rays. This is an oil pastel, 11 x 14, completed with a soft pastel underpainting and an alcohol wash. I’ve included a picture of the underpainting so you could see the beginning stages of this piece. An issue that Oil Pastelists contend with, is we can’t do glazes or tints to get the illusion of see-through because oil pastels never fully dry. To create see-through sun rays I used pieces of pipe insulation to spread very thin layers of oil pastels without disturbing the under layers of cloud paint. May your day be just a little brighter! 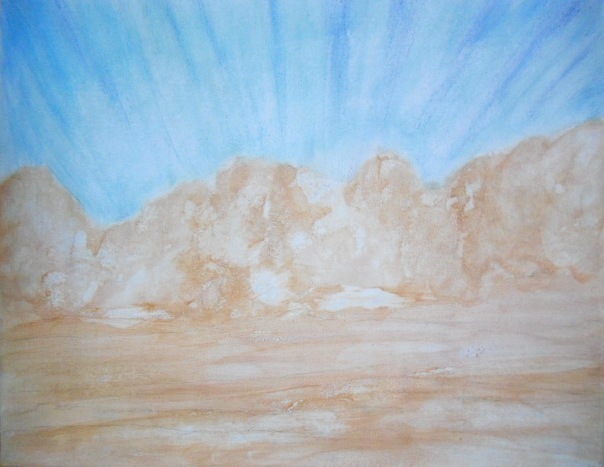 This entry was posted in About Oil Pastels, OPs New Paintings and tagged artist, oil pastels, painting, pastel, rays, sunset, sunset colors, underpainting. Bookmark the permalink. This is so beautiful, Mary! Wow! Hi Lorrie, thanks very much – I haven’t looked at this painting in a long time. Nice to revisit, glad you enjoyed the burst of color! I’m happy you got to revisit… 🙂 Have a super rest of the weekend Mary! Thank you Lorrie and the same to you!! Just dropped by to say hello and see how things are going, and I am blown away by your latest piece. Gorgeous! Oh Patricia, it’s so nice to hear from you. Thank you so much for your wonderful comment and encouragement. I’ve been wondering how you are doing, just went to your blog the other day, but no updates. Hope all is going well with your writing. Well hey Bob, nice to see you. Thank you so much for your comment, I really appreciate it!! Sooooo beautiful, Mary ! Beautiful art on sky canvas ! Thank you so much Violet, I needed a warm scene after the snow paintings. Glad you liked it! Love the boldness of color! Thank you, I appreciate your comments very much! Nice to meet you. Thank you so much, I really appreciate it. Everyday it’s a learning process for me, glad that you liked this one. Mary, you’ve managed to achieve a wonderful glaze effect-terrific! Well thank you!!! I have a ways to go w/figuring out getting a glaze-like appearance w/oil pastels, so your comment was like music to my ears. Thanks! What a stunning picture Mary. Thank your for sharing it. Thank you so much, I really appreciate your feedback! Oh, sensational. I’m thinking of William Blake’s artwork now. Oh Ariel’s Prospero how divine – ha I understand! Thank you for the compliment regarding William Blake, I’m flattered as he was quite the artist of his time. Thank you so much. Excellent suggestion for a title – I’ll remember this! Well, there you go. Thank you for your wonderful comment. I’m hoping you find yourself a beautiful sunset and have some fun! Hey Cat! Thank you so commenting, so nice to hear from you. Glad you liked the painting. Oh my that totally intimidates me! But I’m glad you zoomed in. When I look into the pixels I see changes, ah well they will come at a later date. I’m still smiling – thanks! WOW!! Bursting indeed! Love this! Hi Cyndi, thank you so much for your comment. Colors on this one was a lot of fun to layer in and mix, wish you could have see all the colors. At one point I was really starting to wonder if I’d be able to pull this one off. Thanks! !